There are a number of great resources that provide digital books that can be a great resource for teachers. The graphic novel "Bound by Law translates [copyright] law into plain English and abstract ideas into 'visual metaphors.' So the comic's heroine, Akiko, brandishes a laser gun as she fends off a cyclopean 'Rights Monster' - all the while learning copyright law basics, including the line between fair use and copyright infringement." Produces an eBook titles Educating the Net Generation. This book explores the aptitudes, attitudes, expectations, and learning styles of Net Gen students. This book explores the Net Gen and the implications for institutions in areas such as teaching, service, learning space design, faculty development, and curriculum. Contributions by educators and students are included. 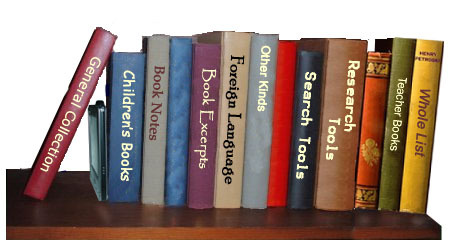 Has over 2000 professional books (including an education section) which can be read online. Online books on reading, including Put Reading First: The Research Building Blocks for Teaching Children to Read. Allows PDF previews of selected books on-line. Our new titles are posted on-line in their entirety for six months. Nine eBooks about integrating technology into the classroom (PDF and FLASH formats). Free textbooks, most of which are in the sciences. Some for viewing online, others may be printed and/or downloaded.